There is a "strong scientific and moral case" for using primates in some research, a report has concluded. It said in certain circumstances, using non-human primates remained the only way of answering important scientific and medical questions. However, the report made a number of recommendations, including the creation of dedicated primate research centres. Scientists welcomed the findings, however an animal rights organisation called it a "whitewash". 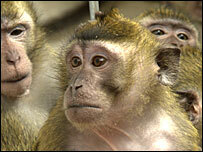 About 3,300 primates are used in British laboratories each year; the vast majority are macaque or marmoset monkeys. Many researchers say primates' genetic and physiological similarities to humans make them a prime candidate for testing the safety and efficacy of drugs (about 75% of primates are used for this) or for more fundamental biological research. However, it is this similarity that makes their use so controversial, and this is reflected in the types of primates that are used. Since 1997, the Home Office, which regulates animal research in the UK, has not issued licences for great apes, including chimpanzees, gorillas and orangutans, which in the animal kingdom are Homo sapiens' closest relatives. The Weatherall report was commissioned by the Academy of Medical Sciences, Royal Society, Medical Research Council and Wellcome Trust to review the scientific case for such research. Its chair, Sir David Weatherall, emeritus professor of medicine at Oxford University, said: "There is a scientific case for careful, well-monitored and meticulously regulated non-human primate research, at least for the foreseeable future, provided it is the only way of solving important scientific or medical questions. "At this moment in time, if we were to take [primate research] away tomorrow, there would be certain areas of science which I think might suffer very greatly," Sir David added. A nine-strong working group spent 18 months examining the areas of science where primates are most heavily employed, although it did not look at their use for toxicity testing of medicines. It concluded non-human primate research remained vital for understanding the basic biology of the brain, neurological diseases, communicable diseases, and some aspects of fertility and ageing. The working party visited four primate centres, and said although the conditions for the animals in these centres were excellent, other evidence they heard from the RSPCA suggested more could be done to improve animal welfare. They suggest that national centres of excellence should be created for primate research in the UK. Focusing all research of this kind in a limited number of UK centres, the authors said, would have huge scientific and welfare benefits. They also recommended continued investment in finding alternatives to primates in the laboratory. But against this backdrop, the report also said UK primate research was in peril. Intimidation by animal rights activists, said Sir David, high costs and a shortage of animals were forcing scientists to pursue non-human research oversees. This, he said, required urgent investigation by government and funding bodies. The report also concluded the often-polarised debate surrounding primate research would be better informed by a more open attitude from scientists and the pharmaceutical industry. Professor Chris Higgins, director of the Medical Research Council Clinical Sciences Centre, said: "Although nobody likes the idea of any research using non-human primates, if it comes to a choice between regulated studies on a few animals and a treatment for an incurable disease affecting hundreds of thousands of people, most people reluctantly make the same choice." But the National Centre for the Replacement, Refinement and Reduction of Animals in Research (NC3Rs) said, while the report should be commended, it did not go far enough. Chief executive Dr Vicky Robinson said: "It is disappointing that, despite a ringing endorsement for the work being done to reduce primate use, the report did not go far enough in trying to map out the priorities for development and adoption of new alternatives." The British Union for the Abolition of Vivisection (Buav) called the report a "whitewash". Buav chief executive Michelle Thew said: "Although we welcome the report's commitments to investment in alternatives, it simply fails to properly address the welfare needs and moral case for subjecting these sensitive, intelligent creatures to a lifetime of suffering in UK labs."